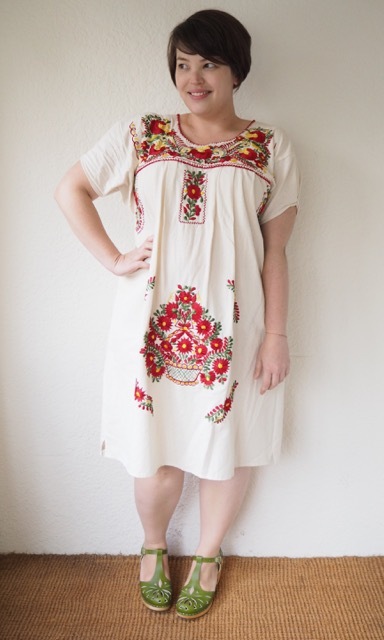 I bought this summery little smock dress in the height of summer, thinking it would be a nice breezy number to wear on reeeeaaallllllly hot days. 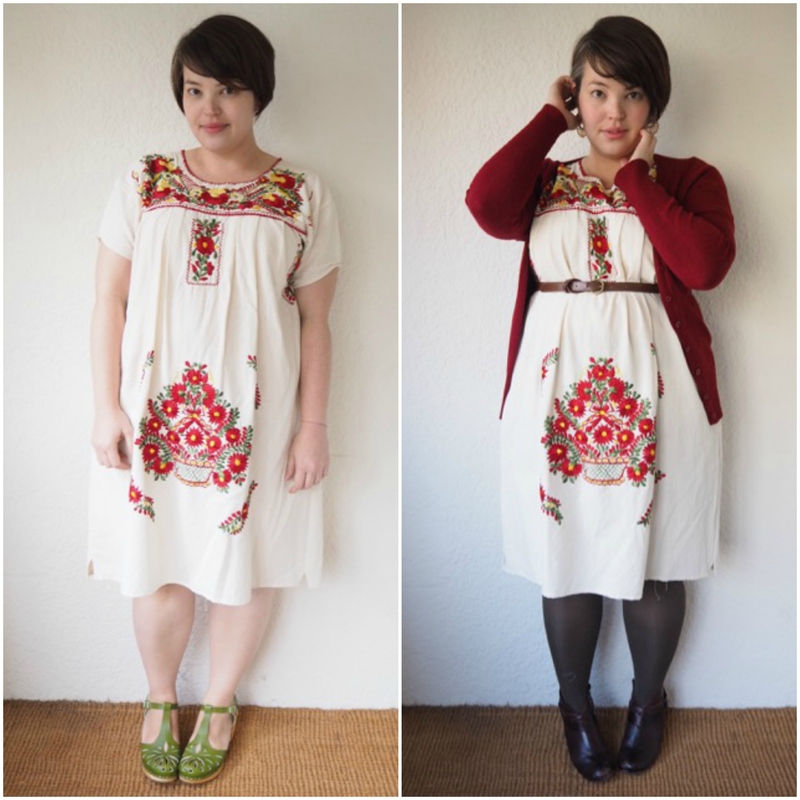 It’s the calico version of Little Tienda’s “Las Flores” midi dress and it’s a really lovely piece. At $139 there are cheaper Mexican-style frocks on the market, but speaking from personal experience they don’t come close to Little Tienda in terms of quality and workmanship. The calico fabric provides a nice natural base for the gorgeous embroidery to stand out against. It’s not as harsh as pure white, and the fabric has a kind of heavy softness to it. The flower motif really glows, it’s impeccably sewn, and hasn’t buckled the fabric the way I’ve found cheaper Mexican dresses do. I’m wearing the XL, which fits with room to spare though I trimmed a few inches off the hem. I wasn’t sure about the sleeves when it first arrived, so I ended up bringing them in a little with a tucked pleat – it’s helped limit the amount of volume around my bust-line and streamline the silhouette a little. 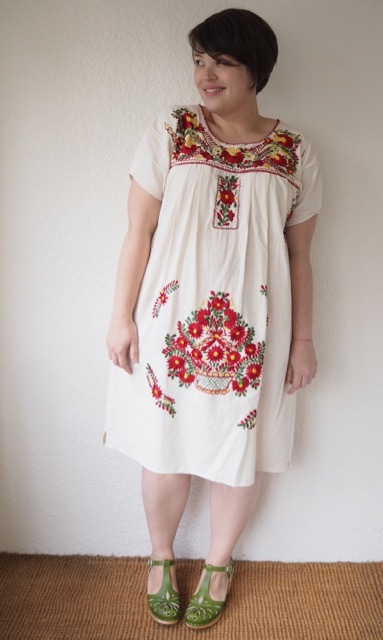 In summer I wear it bare-legged with clogs or sandals, and minimum jewellery, since the gorgeous embroidery really adds everything you need in terms of frou frou. 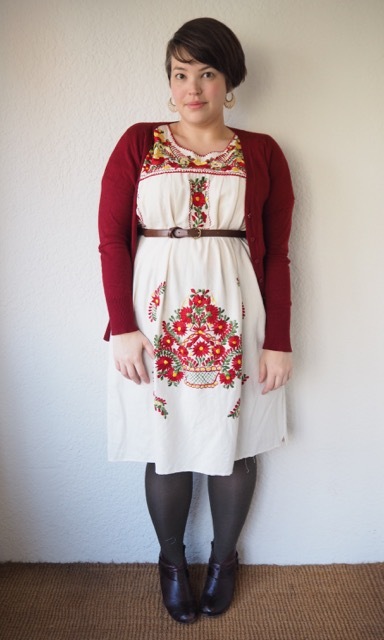 I was surprised by how well this dress worked as a cooler weather frock, when combined with tights and a cardigan. I’m wearing olive coloured tights that pick up the green in the embroidery, but aren’t too dark against the pale fabric of the dress. 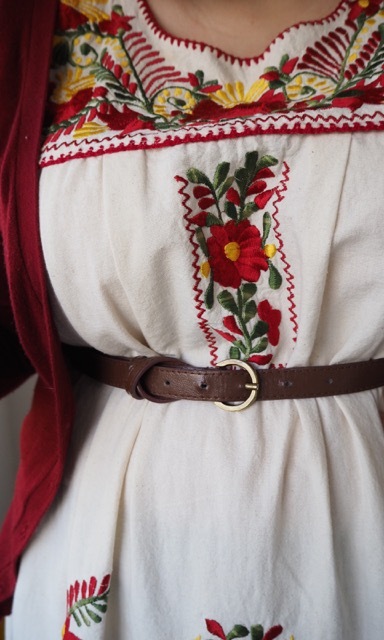 The deep red cardigan is the perfect hue to match with the flowers, and I added a brown belt – worn high – to give a some shape to the layers. I kept the accessories minimal again – this isn’t the kind of frock that needs a necklace or statement earrings – but I couldn’t resist teaming them with the mother of pearl hoops that I’d bought from Etsy last year. They add the perfect finishing touch to a polished hippie-chic outfit that reminds me of summer on a grey day. 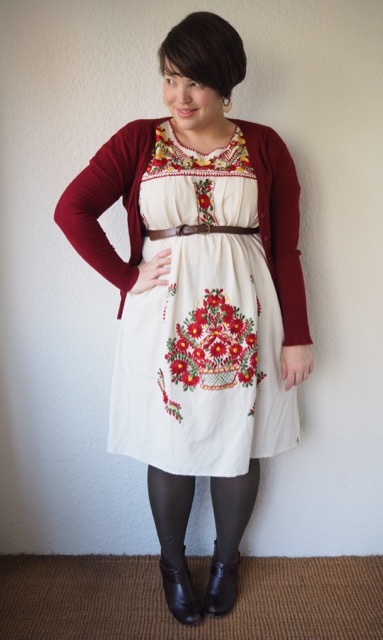 This entry was posted in Uncategorized and tagged cardigan, cold, dress, hasbeens, little tienda, Miz mooz, warm by lillipilli. Bookmark the permalink. I don’t know whether to be happy or sad that this isn’t my size – the embroidery is gorgeous! Think my wallet would take a hammering if they were in larger sizes. I love the shape the belt gives the dress. As much as I love this in the summer, it’s almost cuter with the cool weather treatment! It somehow makes the embroidery pop a little more? Or maybe it’s just so unexpected that it just feels fresh. What a great piece! I keep kicking myself for not buying all the embroidered peasant shirts, skirts and dresses I saw while in Mexico a few years back. That is just adorable. Did you see these Hasbeens on Modcloth? I thought of you. The vamp is done with two hearts sewn together! 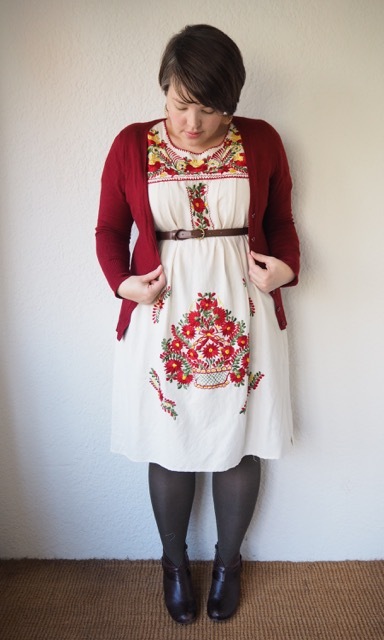 Really like the second look – the cardigan and belt accentuate and frame the embroidery to great effect! I agree completely with Stephie’s comment above: any time I have short hair I pull out my bigger bolder earrings and enjoy having them on show. Love your green hasbeens, too! Love this look! And I just snaffled the last pair of those fabulous mother of pearl earrings from Etsy! Hope they look as fab on me s they do on you. 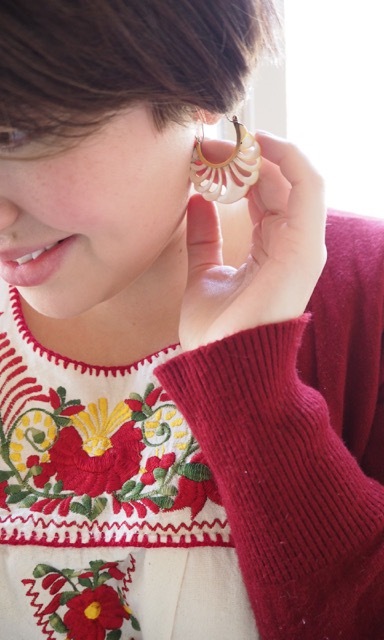 Your new shorter hair is perfect for wonderful earrings. Cheers to you!